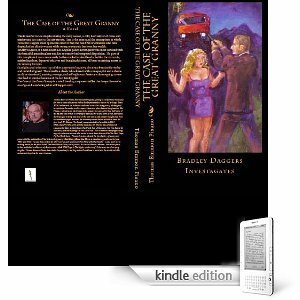 When a book like The Case of the Great Granny comes along, I find myself stunned. I don’t like the feeling that I am crushing someone’s dreams or being harshly critical. However, I can’t sugarcoat what this book represents. The Case of the Great Granny simply has no redeeming qualities. This goes way beyond grammar, punctuation, capitalization, and spelling errors, although those are frequent, glaring, and appalling. There are tons of run-on sentences (too many to cite). There is a horrifying abuse of commas, and an even more nauseating lack of them when needed. In possibly the most amusing coincidence, while trying to read the newspaper, the main character, Detective Daggers, asserts that the annoying thing was these guys wrote like hacks. The dialogue, characters, and plot development are, at best, weak. Example: When the granddaughter of the murder victim is asked her whereabouts at the time of the crime, she informs Daggers that, Midnight, I was screwing my boyfriend at the time. Really? Then Daggers gets the suspect list and his immediate reaction is that it seemed to be incomplete. Really? Precisely how did he come to that conclusion, since it has only been hours since the body was discovered? Is he psychic? Whatever it is, he wastes no time in calling the evidence clerk and demands to know why the victim’s husband is not on the list, yet he doesn’t know if the man is alive. He goes on, Is there anyone else who is missing off this list? Could your people include them and him on this list? This list is very important to me for the follow-ups? What? He’s the detective on the case; shouldn’t he know who the suspects are? And, how exactly did the research turn into a suspect list with 20 names on it in under 12 hours? It only gets worse. After questioning the granddaughter, he realizes that he was craving her (although there’s little to indicate that type of sexual chemistry, other than the author stating that) and ponders whether he should â€œpick up some fox in a bar and just go home and blast myself into some pretty face for a couple of hours. I was confused. So am I. Blast yourself into some pretty face? What does that even mean? How about this gem: Percy, have you ever been arrested or convicted, you know what I mean? His face changed a little, he started to manifest those primal things that black men usually manifest because of our white oppressive attitudes since the inception of America. Ugh. This is not only bad writing, it is overwhelmingly and nauseatingly racist, and not very bright for a seasoned detective. I’ve never heard of an officer asking a suspect if they’ve ever been convicted; in fact, it’s pretty silly to ask someone if they’ve ever been arrested or convicted, because you’re not subject to one or the other. You have to be arrested to be convicted, so a cop likely wouldn’t ask both. This is the most poorly written book I’ve ever attempted to read. It goes beyond the editing process, which apparently was non-existent. It begins and ends with the author, who quite simply lacks writing skills. Steer clear of The Case of the Great Granny. However much time you spend reading it will be time you can’t get back. Thank you for your review, you have opened my eyes.